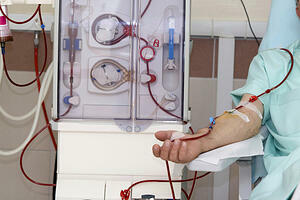 Transonic Hemodialysis Surveillance tracks a patient’s vascular access flow over time. Unlike other technologies that can only identify outflow stenoses in AV accesses, HD03 Monitor surveillance can detect a stenosis wherever it occurs within the vascular access circuit: inflow, outflow or between the needles in both fistulas or grafts. If access flow decreases below a critical threshold, fistulograms or interventions can be scheduled proactively to delay access failure. Such early intervention with minimally invasive restorative flow procedures reduces morbidity and costs.5 The clinic can continue to administer dialysis, collect and analyze data, and reduce its dependence on outside services for costly studies and lab tests. 1 National Kidney Foundation. K/DOQI Clinical Practice Guidelines for Vascular Access 2006 Updates, http://www.kidney.org/professionals-/kdoqi/guideline_upHD_PDVA/va_guide4.htm. 2 European Renal Association-European Dialysis and Transplant Association (ERA-EDTA), European Best Practice Guidelines on Haemodialysis: Guideline 5.2. Nephrol Dial Transplant 2007; 22(Suppl 2): ii99-ii100. 3 KHA-CARI Guideline: Vascular access ñ central venous catheters, arteriovenous fistulae and arteriovenous grafts. Polkinghorne KR, Chin GK, MacGinley RJ, Owen AR, Russell C, Talaulikar G, Vale E, Lopez-Vargas PA. Nephrology 2013; 18(11): 701-5. 4 Nesrallah GE et al, “Canadian Society of Nephrology guidelines for the management of patients with ESRD treated with intensive hemodialysis,” Am J Kidney Dis. 2013; 62(1): 187-98.